On November 14, 1973, the George Mason University Board of Visitors agreed that Rector John C. Wood would send a letter of intent regarding the creation of a law school to the State Council of Higher Education in Virginia (SCHEV) in Richmond. A feasibility study that was already underway would be continued, and an advisory committee of citizens would be established to present a report on their findings to the Board as soon as possible. The next day the letter was sent and what would prove to be a long, hard battle was underway. George Mason became an independent university in the spring of the previous year and President Lorin A. Thompson began drafting plans for expansion almost immediately. John T. “Til” Hazel, an attorney, real estate developer, and a driving influence behind Mason’s acquisition of the Law School, had served the University in a variety of ways. He was a member of Mason’s Advisory Board, a member of the first Board of Visitors (later the Rector), and as both member and chair of the Board of Trustees of the George Mason University Foundation, which he had helped to establish. Hazel believed that George Mason would need a law school in order to become recognized as a world-class university: “It would give professional status to the University and raise it above the community college status it otherwise always would have… [George Mason] needed a professional school, and the law school was the doable way to achieve that because it was not capital intensive. Mason desired the support of the State Council of Higher Education for Virginia (SCHEV) and needed the approval of the General Assembly before it could proceed. While Rector John Wood and the Board of Visitors petitioned SCHEV, Hazel began a five-year lobbying effort in 1973 to requesting the General Assembly’s support, but his efforts had borne no fruit. Undeterred by the previous dismissal, the Board of Visitors formally requested permission from SCHEV to establish a law school on September 26, 1974. The Law School Advisory Committee held that “…The establishment of a law school at George Mason University represents an educational bargain to the Commonwealth of Virginia. With no capital outlay requirement and a small operating cost, the state can fulfill an obligation to its citizens and at the same time relieve the growth pressures on other institutions.” The Board believed this proposal made a great deal of sense, considering the law schools at the University of Virginia and William and Mary were unable to serve hundreds of qualified students because of a lack of space. They planned to house the law school at George Mason’s North Campus (the former Fairfax High School acquired by George Mason in 1971), so no construction costs would result. Wood hoped that the law school would be approved by SCHEV so that it might receive the General Assembly’s backing during its brief 1975 session, in which case funds could be allotted for the University’s 1976 – 1978 budget. The Advisory Committee projected an enrollment of 300 – 400 students in its first year; Virginia students would pay $1000 per year, and out-of-state students, $2100 per year. Some legislators, like Edward Holland, a state senator from Arlington, believed the Committee’s report “made an excellent case for the law school, pointing [out] the problem, the need and the feasibility for establishing the School within current budgetary limitations,” though he cautioned that the economic downturn during that time might present a roadblock to the proposal’s ratification in the General Assembly. In November 1974, the Board of Visitors received disheartening (and indeed hurtful) news. 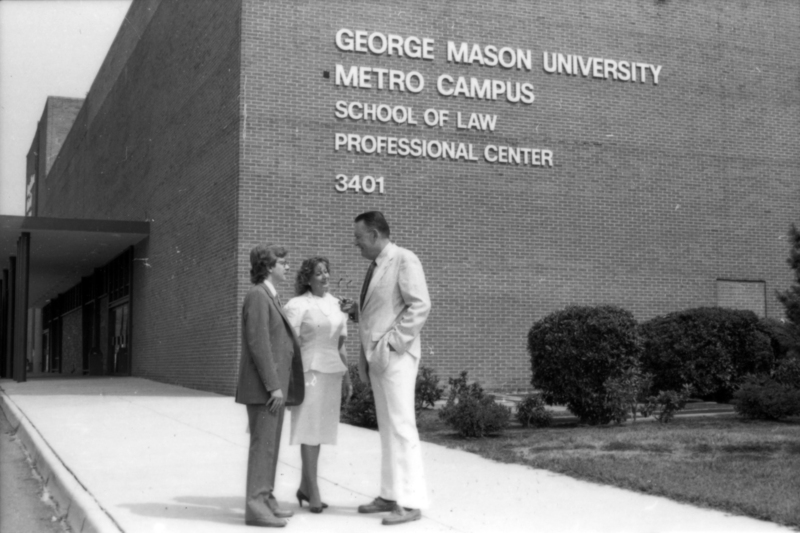 SCHEV had produced its own report about the feasibility of a law school at George Mason, and its desire to prevent the establishment of one was quite clear. George Mason, it maintained, was a “regional” university, independent for only two years, and as such, it “must be regarded as a developing institution with a promising future but one which has yet to establish either a reputation for excellence or the facilities required to achieve excellence.” The report cited graduate programs that were not yet “fully productive,” a “markedly inadequate library,” lack of development, and the need for “considerable expenditures and commitment” among some of its concerns. It also relayed the expectation of Millard Ruud, Executive Director of the Association of American Law Schools, that “it [is] essential for a new law school to be competitive with the middle range, or average, law schools in the United States…there is simply no need or justification to start a new law school at any lower level.” Seemingly associating George Mason with “lower level” institutions, the report attempted to console the Board of Visitors by offering: “[i]t is, in fact, more essential that a law school be part of a major university than it is that a major university have a law school.” The letter concluded by noting that the Council staff felt that George Mason was not the proper place at which to establish a law school, “even if one were needed in Virginia…It is clear from its [George Mason’s] own study that [the] university cannot, at this time, aspire to such excellence.” Not surprisingly, the Board of Visitors’ request was struck down in the January 1975 General Assembly, as well. his hand at it if he wants. While Mann lamented the decision, it was praised by another editorial in the Richmond Times-Dispatch: “In restating its opposition to the establishment of a law school at George Mason University in Fairfax County, the State Council of Higher Education made exactly the right decision. It would be an egregiously irresponsible act for the General Assembly to override that decision.” The author expressed concern about spending during a period when funds for local schools and state colleges had been reduced and believed that the state already produced enough lawyers, continuing: “There is neither need nor money for such a facility. Until both materialize, George Mason’s proposal should be filed and forgotten.” Following the two failed attempts and the wishes that the proposal be “filed and forgotten”, individuals within the George Mason community were beginning to feel as though their institution was not being treated as a “real university.” Former president of George Mason University, Dr. George W. Johnson, would later say, “[a] law school was the mark of a real university. For that reason, if not for others, it was fiercely resisted [by the state educational system].” The two sides were pitted almost bitterly against each other—and George Mason was losing. The winds of change would sweep through Northern Virginia later that year. The International School of Law (ISL) in Arlington was experiencing difficulties gaining accreditation and faced imminent closure. Realizing that a merger between the two schools would be mutually beneficial, Til Hazel and ISL dean, Ralph Norvell, met and agreed to work together for the mutual benefit of both parties. After meeting and entering into negotiations, the George Mason Foundation purchased the ISL property in Arlington’s Virginia Square neighborhood for $3.2 million in November 1978, one month before ISL’s lease was set to expire. The Foundation, a non-profit corporation established to supply the university with funds beyond that which it receives from the state, initially intended to lease the former Kann’s Department Store building, to prospective businesses to raise money for a new law school. Following this relatively bold move, SCHEV issued another report to the General Assembly strongly recommending that the merger not be approved. Things looked bleak for George Mason, as it faced a third rejection. The situation was even bleaker for ISL students, whose degrees would mean nothing without the merger because their school was not accredited. On November 7, 1978, Dean Norvell sent a message to the students and faculty of the ISL: “I regret that I must confirm what most of you already know. [SCHEV] has acted unfavorably as to the authorization of a law school at George Mason University with the obvious consequence as to merger….There is no ambiguity as to the unfavorable nature of the Council’s action in terms of plans George Mason has been proceeding upon.” The next day, he added that the Board of Visitors and administration at George Mason were not prepared to back down, but that “the responsible officials at GMU do not consider the matter resolved and have pledged to do all that is within their power to see the matter through to a successful conclusion.” As preparation for the 1979 General Assembly Session began, Norvell commended his students for their poise and composure during such an uncertain period. Dean Norvell’s students were more than just simply poised and composed. They became energized, and in the end they would play a crucial role in influencing the General Assembly’s final decision. In February 1979 several ISL students traveled to Richmond to personally lobby the General Assembly on behalf of the merger. Til Hazel also drove to Richmond to appeal to the legislature. Time was of the essence, because the Assembly is only in session for thirty days during odd-numbered years. “I was down there lobbying every way I knew how, but the real lobbyists, the effective ones, were the law students,” Hazel said. “They went down there and talked quietly and behaved and got the job done. The legislators saw they weren’t a bunch of student radicals, but were serious people who wanted a good law school.” Legislators noted the power of their presence; one found them the “most positive effort of the merger campaign,” and many legislators would vote against SCHEV’s opposition this time because of the passion and eloquence of the ISL students. With the General Assembly’s passing of the bill, ISL merged with George Mason to form the George Mason University School of Law. The former ISL students received accredited degrees during the spring of 1979 and were able to take the bar exam. George Mason finally had a law school and the prestige that came with it. Harriet Bradley, a former Fairfax County supervisor and member of George Mason’s Board of Visitors, later noted that Til Hazel and George Johnson (along with the help of many others) “accomplished the seemingly impossible. [The acquisition of the law school is] a remarkable story.” After losing several tough battles, George Mason University had finally won the war. Browse other items related to this topic. Lorin A. Thompson, “Report on a Law School at George Mason University,” C. Harrison Mann, Jr. papers, Collection #C0094, Special Collections and Archives, George Mason University, Box 20, Folder 15. Russ Banham, The Fight for Fairfax, (Fairfax, VA: George Mason University Press, 2009), 187. Lorin A. Thompson “Report on a Law School at George Mason University”, C. Harrison Mann, Jr. papers, Collection #C0094, Special Collections and Archives, George Mason University, Box 20, Folder 15. "Report of the Law School Advisory Committee," C. Harrison Mann, Jr. papers, Collection #C0094, Special Collections and Archives, George Mason University, Box 20, Folder 15. Press Release, Sept. 27, 1974, George Mason University Office of University Relations press releases, Collection #R0004, Special Collections and Archives, George Mason University, Box 6, Folder 4.24. "Tentative Report of the Law School Advisory Committee," C. Harrison Mann, Jr. papers, Collection #C0094, Special Collections and Archives, George Mason University, Box 20, Folder 15. Banham, The Fight for Fairfax, 188.